If you are looking for something a bit different, a bit kooky and a complete hoot, has Showko got a show for you! This has got everything; suicidal Ninja cat, romantic Sushi Master, flat Hello Kitty and a lesson in the ancient Japanese art of Rakugo. Showko is multi skilled and multi lingual, performing all her skills in a language that is not her first which is impressive in itself. 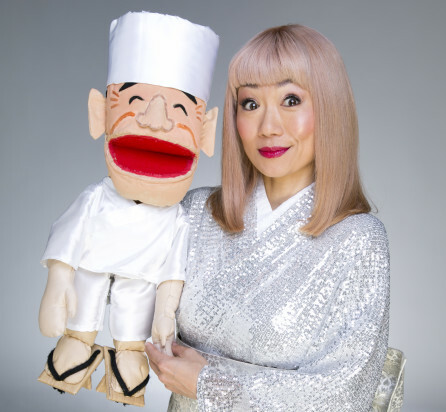 Originally from Japan, Showko is possibly best known as a highly skilled comedic ventriloquist and she certainly shows off some gobsmacking vent skills here. The puppets she uses are all homemade and as quirky as Showko herself. If you are a fan of things Japanese, Absolutely Normal is definitely an enchanting introduction to Japanese culture in entertainment. Ever the enthusiastic host, Showko is dressed in a silver lame Yukata (an informal Kimono) with funky new silver sandal shoes bought in Japan recently and has many tales to impart. Some of her standup material is about cultural differences but most of it comes out of personal stories and experiences, such as going back to Japan and realising that she’s become more Australian. There’s a lot packed into Absolutely Normal, but it has a carefully thought out structure that eases the audience into Showko’s wacky world. She introduces us to herself with some standup that is fairly conventional though no less fascinating about experiences with Japanese and Australian toilets. Then she wows us with her ventriloquist comedy before moving on to teach us about the traditional Japanese style of comedy called Rakugo. It is similar to storytelling standup except is it is sitdown comedy. She demonstrated with a surreal story about a cherry tree with gorgeous props, gestures and the audience’s imagination. Finally some more ventriloquism with Sushi Master and a bit of harmless audience participation. Absolutely Normal is, of course, anything but normal but in a most wonderful and hilarious way. Take your friends for a delightfully offbeat night out.